Unknown gun men attack family, disappear with 2 kids in Imo State - BlogIT with OLIVIA!!! The harmony in Ezeohan village in Owerri- Nworji community of Nkwere Local Government Area of Imo state was disrupted on Thursday by the frantic voice of Mrs Queen Ihieme following the invasion of her home by unknown gunmen. It all happened around 1.30am so nobody around the neighborhood was out to her help but when dawn came, she was found in a pool of blood.Another man with her later discovered to be her brother in-law, Tochukwu Ihieme, a member of staff of Vanguard Media limited, was also soaked with blood. They were too stunned to tell bewildered sympathisers what transpired. The gunmen suspected to be kidnappers, were three. They were said to have forced their way in through the back door. By then, Tochukwu Ihieme, who came visiting the previous day, woke up following the disturbing sounds, only to be hit with a matchete by one of the intruders. Narrating his ordeal to Crime Guard, the Vanguard staff said: “I am from Anambra state but my younger brother, Nnamdi Ihieme, resides in Imo state with his family. My aged parents were with him. I travelled to his place to enable me take my parents who were sick to the hospital in Imo state and then go back to my base in Anambra. That fateful day, I went to the bank to withdraw N20, 000 with which I bought food stuff which my parents were to take back to Anambra state. We intended travelling the next day. They did not even give me any room to respond. Rather, they started beating me with the machete and axe. The third one even threatened to shoot me if I made any effort to fight them. They even matcheted my brother’s wife . At the end, they went away with my brother’s two children…” at this juncture, he held his head groaning in pain.. While Tochukwu was discharged from the hospital after receiving treatment, same could not be said of Mrs Queen Ihieme who was still on admission a week after the incident. Her distraught husband, who was at work when the incident happened, rushed home after a concerned neighbour broke the sad news to him. According to the husband,, he said: “I don’t know why this kind of fate has befallen me. I do not have problem with anyone that could have warranted such ill treatment on my innocent children. I do not know where they are at the moment. We have combed the entire neighbourhood and beyond without luck. This is the first time an incident of such would happen in my community. It was even after it occurred that I was informed that a child was beheaded three days before this incident at Umudi community. “My work usually takes me away for a week or more. I had to rush back after spending three days because of this heart- rending news. My wife is still on admission owing to the deep machete cuts on her head. It is more disturbing because no one has called to demand for ransom for their release. 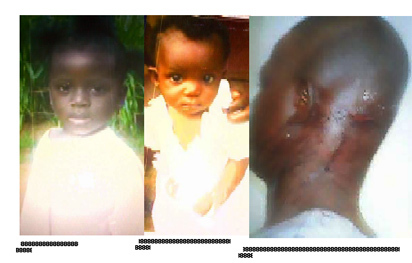 Please, whoever is with my two-year and six months old Adanna and one year, six months old Kansimyochukwu , should have mercy on them and bring them back to us. We are not rich, we are barely managing to survive,” he said, calling on the Police to come to their rescue. Meanwhile, Crime Guard gathered that policemen had arrested owner of a local drinking joint where Tochukwu stopped to buy recharge card. In the process, a conversation ensued between him and some villagers who were unwinding at the joint, at the end of which he was said to have disclosed who he came to visit. It was gathered that the owner of the place and his wife were later released . As at yesterday, Police sources hinted that investigation into the matter was still ongoing.